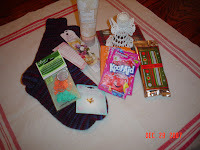 Here is a photo of the things I gathered to send to my knitting participant in Northern Europe. I learned a lot about sending things overseas -- each country has certain restrictions for what you cannot send . . . such as anything with alcohol -- not the drinking kind, but the other kind! I had purchased hand lotion and discovered that it had alcohol in it! I didn't know if it was legal or illegal, but didn't take a chance and didn't send it. I also found out that it is quite costly to send things overseas. I was able to complete a pair of socks. The Kool-aid isn't for drinking! I discovered that people use it to dye yarn! you can send me a package! tortillas, and quarters, and mom all wrapped inside!